This weeks challenge will focus on adding more fruits and vegetables to our diet. The recommended amount is 5-9 servings a day. Some of us have no problem eating fruits daily. but we may find it more difficult adding leafy greens to our daily diet and vice versa. Make a fruit and vegetable smoothie for breakfast. 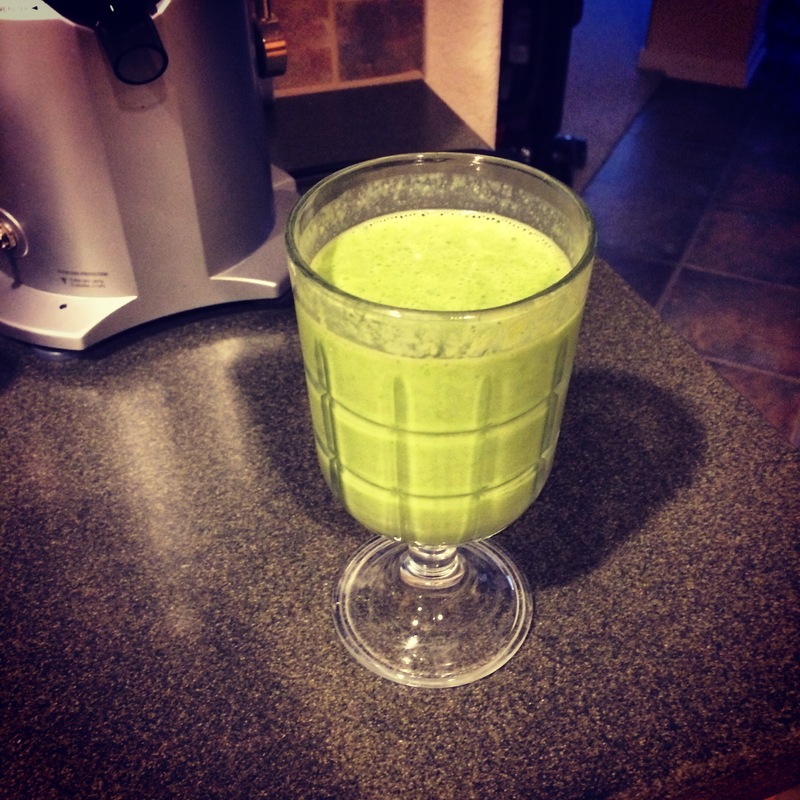 This is my favorite breakfast smoothie recipe: 1 cup almond milk, 2 handfuls spinach, 1 handful kale, 1 frozen banana, 1 tbs nut butter, 1 frozen peach, 1/2c plain greek yogurt, blend and enjoy. Make vegetable omelette and serve with a side of fruit. Have a huge salad for lunch and or for dinner, just make sure you add healthy fats and lean protein. 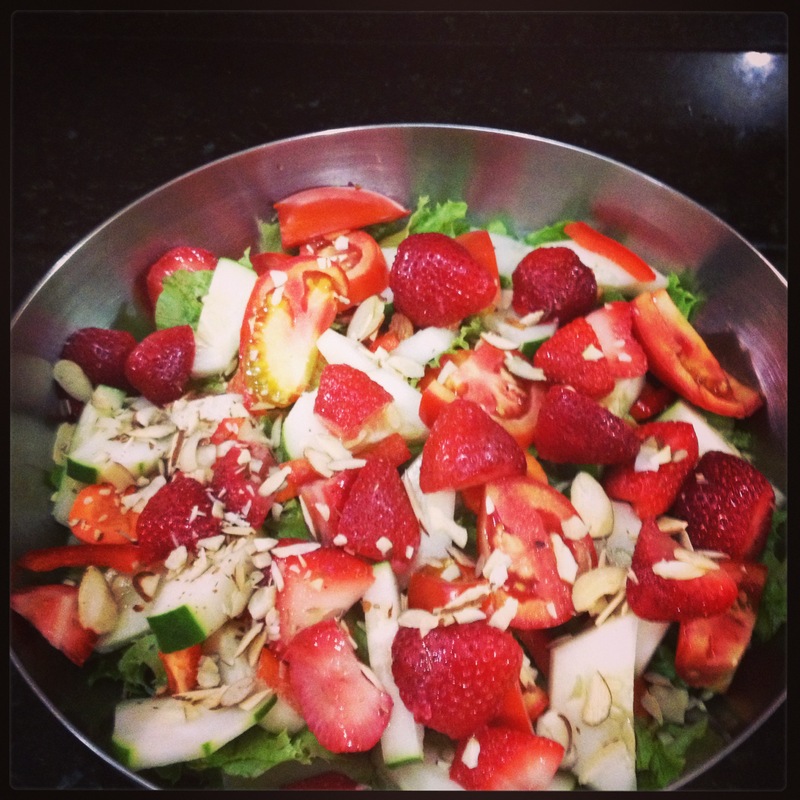 This is one of my favorite salads: romaine lettuce, red bell pepper, cucumbers, tomatoes, carrots, strawberries and slivered almonds. It helps to think of vegetables as the main part of your evening meal and lean protein as a side. As always I will be doing this with you. What are your favorite ways to add more fruits and vegetables to your diet? 10 Pictures of your daily recommended servings of fruits and vegetables. This entry was posted in Pilates, Quotes, Recipes, Uncategorized, Weekly Challenges and tagged breakfastsmoothie, greensmoothie, saladrecipe, salads, thekitchn, weekly challenge. Bookmark the permalink.